Sign-up deadline is Feb. 21.. Flies are due in my mailbox on March 21st..
Toe-tag all your flies: Your Board name & Name of pattern. Winter Dreams Fly Swap Sign Up..
ok- I'm in, now, what to tie? I'm in too. Will post what I'll tie later or should I keep it a mystery? After all, I don't know what I'm tying until its done. I'm in, still unsure of the tie though. Count me in too. Just off the top of my head, i realize that I fish a lot of small stuff during the winter, so it might be something small. ...... Or a streamer. Ah, I'll figure it out later. If possible I would like to get in on this swap. 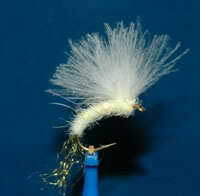 I will be glad to tie up my go to cornuta emerger as that is my favorite hatch to fish on the system. Heres a shot of a sulpur emerger that is very similar.. however on the cornuta I mix the wing color and do the body sparser. I have not particiated in a swap on this board in awhile. Please put me down for wet flies. I am just not sure which one. Will let you know my pattern in a day or two. Before it's filled, please count me in too! Not sure about the pattern yet but I am sure I can come up with something productive! I'll be doing brown drake spinners #8 tru form style.